Basil: This is your second large distribution of basil and is great used fresh in soups, sauces, salads, sandwiches, or of course to make a delicious batch of pesto (recipe below). Corn: Out at the farm we are always at the whims of the weather, and unfortunately the weekend’s high winds and record rainfall completely knocked down our final corn planting, making this your final week of corn. This final planting of Silver Queen corn was exceptionally tall and heavy with maturing ears, making it more susceptible to lodging. 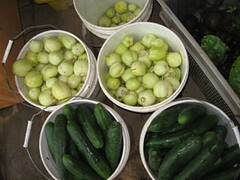 Cucumbers: The height of the cucumber season is passed and cucumbers are now on their last round of rotation. Enjoy them while they last, as they will be rotating through your shares for the next couple weeks. Lettuce: This week you will receive two heads of lettuce from the Seeds of Change trial beds. This season we worked with Seeds of Change (an organic seed company) to plant over 96 lettuce varieties, many of which are unique or rare and not yet available for seed in the United States. This trial aimed to identify which of these varieties do best in our climate. 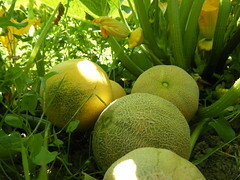 Melons: A this point in the season you have received several distributions of melons in your shares. The height of the melon season is passed and they are now on their last round of harvest. Enjoy them while they last, as they will be in your shares on rotation for the next couple weeks. 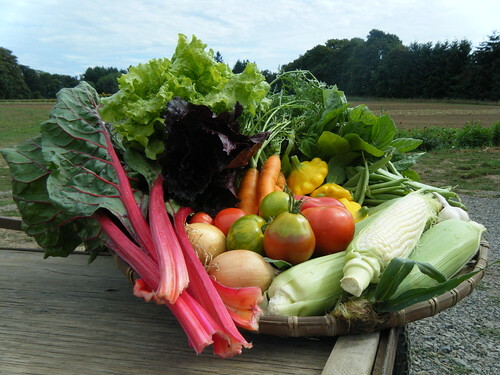 In addition to the crops SIO grows for our 400 member CSA program, we also grown and sell produce to over 40 different Portland area restaurants and kitchens, and this season at SIO we decided to partner with some of those restaurants for some culinary inspiration. We have been picking the brains of some of the areas most talented chefs and restaurant owners, and have asked them to provide us with recipes and general cooking techniques based on the crops that you receive in your shares. Out at the farm we crop plan separately for both our CSA program and restaurant sales, so you don’t have to worry that part of your share may be going the restaurant down the street. For the month of September our featured restaurant is Lincoln, located in North Portland at 3808 N. Williams. I have been working with SIO products since my days at Wildwood (1998 and 1999). I have worked a few Plate and Pitchfork dinners at SIO and really love that we are working with your produce at Lincoln and Culinary Artistry! Here are some recipes I came up with, I hope they work well for the home cook. 1 large head lettuce, cleaned and leaves separated. Drizzle olive oil and balsamic vinegar into bowl and toss with lettuce, slices of plum, sliced onion, and toasted pine nuts. Season with kosher or sea salt and black pepper and shave pecorino over salad. Caramelize sugar, dry, in heavy-bottomed pan. When sugar turns golden, add vinegar and tomatoes and allow tomatoes to wilt and pop. Add onion, mustard seeds and garlic and cook for a couple minutes to allow flavors to marry. Cool conserva. Add basil and season with salt and pepper. Serve on grilled bread with goat cheese or ricotta cheese. Toss beets with olive oil and water, season with salt and pepper. Put into oven-proof roasting dish and cover with foil. Roast at 350 degrees, about 45 minutes, or until beets become soft, or able to be pierced with a skewer. Cool beets and peel skin off. Halve beets and lay on a plate. Scatter crumbled blue cheese and hazelnuts over beets. Drizzle olive oil and scatter sea salt to taste over beets, nuts and cheese. Slice leeks into half-moons, about 1/4-inch pieces. Melt butter in pan over medium heat and add leeks. Cook leeks until they are wilted and cooked through. In a small bowl, whisk eggs with cream. Pour over leeks and stir with a spatula until the eggs are softly cooked. Season with salt and pepper and place cooked eggs over toast. Sprinkle with coarse sea salt and chopped parsley. If you have a nub of Parmigiano reggiano, grate some over the top! Note: This same recipe works equally as well with spinach or kale, as well as with fennel and mushrooms. In a large saucepan, cook the bacon over medium-high heat until golden but soft. Remove to drain on a paper towel. Add the onion, marjoram, and sage to the pan and cook stirring often, over medium heat until onion is pale golden, about 10 minutes. Add the vinegar and stir to deglaze the pan, loosening any stuck bits. Add the mustard and stir until smooth. Bringing the sauce to a gentle boil over medium-high heat, add the chard without stirring, and cover tightly. Reduce heat to medium and cook, covered, until chard is limp, 3 to 4 minutes. Stir the chard into the sauce and serve at once, garnished with bacon. Serves 4 as a side dish. Note: Slow roasting tomatoes is not very hard and results in a delicious flavor that can be used with vegetables or meats, and will freeze well for use in winter soups and stews. Preheat oven to 300°F. Lightly oil a large shallow baking dish. Slice the tomatoes in half lengthwise. Set them cut side up in the dish, then brush the tops with oil, using about a tablespoon in all. Sprinkle with salt and pepper and add the herb and garlic. Bake, uncovered, for about 2 hours. Check after an hour and drizzle a little more oil over the surfaces if they look dry. If you don’t plan to use the tomatoes right away, store them in the refrigerator, or freeze. Preheat the oven to 350° F. Slice the onions and begin sautéing over medium heat. After the onions are started, fold out your piecrust onto a flat baking tray (you may need seal any cracks with some water). Poke holes around the crust with a fork, and place in the oven for 4-8 minutes to crisp (when its very lightly browned). Set crust aside. After the onions are browned, cut the tomatoes into bite sized pieces. It is best to let them onions cool before you really get started with the assembly. For assembly, spread a layer of pesto (recipe below) on the tart (as thin or thick as you want it). Next, apply a layer of the onions (again, as thin or as thick as you want). Crumble the goat cheese on top of the onions to cover as best you can. Next, put a layer of tomatoes on top of the goat cheese (you may not need to use all of the tomatoes you chopped). Sprinkle with a little basil and some salt and pepper. Put in the oven at 350° F for 20 minutes, or until the tomatoes are soft. Note: If you have never made fresh pesto you are truly in for a treat. Its easy, delicious, and can keep for up to 6 months in the freezer (or up to a year if you don’t add the cheese before freezing). 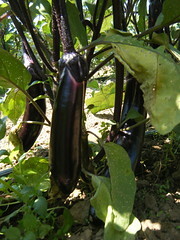 Put basil and garlic in a blender or food processor and pulse until coarsely chopped. Add the toasted nuts and pulse a few more times. Now pour the olive oil into the blender/processor relatively slow with the blender/processor going until a paste is formed. Add the Parmesan cheese and continue adding oil (up to 1/2 cup) until your desired pesto consistency is achieved. Add salt and pepper to taste. You may also add in 1-2 tablespoons lemon juice near the end for a more tangy flavor. Makes approximately 1 cup pesto. Great on pasta, sandwiches, vegetable dishes, corn on the cob, toast, and many more things. Mix zucchini with salt and let stand 1/2 hour. Rinse well with filtered water and squeeze dry in a tea towel. Mix with eggs, onion, breadcrumbs, cheese, and cayenne pepper and season to taste. Form into cakes and sauté a few at a time in butter and olive oil.